This stone really jumped out at me when I saw it mixed among many others. After reading its description I can understand why! Known as the Tempest Stone, its highly charged energy is almost tangible. Just as lightning clears the air and makes all things new, Pietersite discharges negative energies and emotional turmoil, and cleanses the aura, restoring it to calm. For those who have tried and failed many times to beat an addiction, Pietersite is an extremely supportive and strengthening stone. It explores causative influences, increases the resolve and lends will power in following a curative program. Pietersite also boosts self-esteem when worn consistently. It is especially empowering for creative people who lack confidence in their abilities. Pietersite is an important tool in bringing pent-up, internalized feelings and conflicts to the surface, allowing the unsaid and unexamined to erupt in an emotional outpouring that not only clears the air, but begins the process of healing. An excellent ally for those who are stuck or unable to make progress, Pietersite helps to clear stagnant energies, habits and life patterns, and reveals new directions for one's life. It also lends the will to take action toward those new goals. Pietersite removes the illusion of separateness, and the beliefs and conditioning imposed by others. It brings one to the source of their own inner guidance, and assists one in recognizing the truth or falsehood of others' words or actions. It promotes speaking out and exploring anything that may hinder access to one's own truth. Pietersite is a variety of Quartz, composed naturally of Tiger's Eye, Hawk's Eye and Jasper, and is characterized by an incredible chatoyancy (cat's eye effect or optical reflectance effect) and brilliance of life within the stone. It is found in Africa. The most common Pietersite is gold but it is also rarely seen in red and even rarer is blue. Note: This information is provided for curiosity only and in no way is meant to be taken as medical advice. Aren't these gorgeous? These were one of my first purchases at the bead shows in Tucson last month.I am thinking pendants or set into a bracelet or....? Montana agate is usually a creamy light yellow to almost clear color with embedded moss structures in varying shades of brownish red to black. This agate is also referred to as "moss agate" (an agate that has colored inclusions that may resemble moss) or "scenic agate". Most are found in gravel deposits from the Pleistocene age (10,000 - 1,6000,000) in the area of the Yellowstone River and its tributaries. Along with sapphire, it is a state gemstone for Montana. One of the most attractive features of Montana agate are the colored inclusions, made up of minerals such as iron and manganese. These inclusions form when mineral rich water moves into the rock through cracks or fractures and the minerals in the water are deposited within the stone. Agate is the Mystical birthstone for the month of September and the birth stone for the Zodiac sign Gemini. Agate is suggested as a stone to give on the 12th and 14th wedding anniversaries. It is a stone of protection, strength and harmony. It is also known as a good luck stone. Agate is a very protective stone. It is especially protective for children, and makes an excellent stone for children's amulets, medicine bags, jewelry, or just to carry around in a pocket. Agates are said to be especially useful for protecting children from falling. Agate is said to strengthen the body and the body's connection to the earth. Physically, agate is said to be particularly helpful with tooth and gum issues, stomach problems, physical endurance, and insomnia. Agate enhances creativity and strengthens the intellect, making it a beneficial stone for both students and artists. As a stone of harmony, agate balances yin/yang energy. Agate can cleanse and stabilize the aura by removing and/or transforming negative energy. Because of the harmonizing qualities of agate, and its emotional energies of removing and releasing resentments and bitterness, it is also considered by many to be an excellent stone for helping to heal and improve relationships. Agate is thought to be a stone of marital and romantic fidelity. Note: This information is provided for curiosity and is in no way meant to be medical advice. Well I finally found my way home from Tucson! Now I have to sort, count, price and store all my new treasures. This will take me several days. I actually enjoy this because I like to organize things. I can see where many of you would find this very tedious. I added a penny in the picture below for scale. These are teeny tiny stone beads!! Starting at the top of the pic they are turquoise, green jade, malachite, turquoise, lapis, turquoise, coral, brown jade, coral and coral. I have so many ideas on how to use these beauties. But before I can do that I need to count them. Yes, count them!! I need to know how many I have, divide that into what I paid so that I can get a price per bead. I lay out the strings of the same type next to each other to see if they are the same length. If yes, then I only count one strand. If no...then I count them all!! Why do I need the price of each bead you ask? Because when I create a piece, I need to know the exact cost of the materials that went into the piece. This number gets included in my pricing formula. In this pic are about a quarter of the stones I brought back. 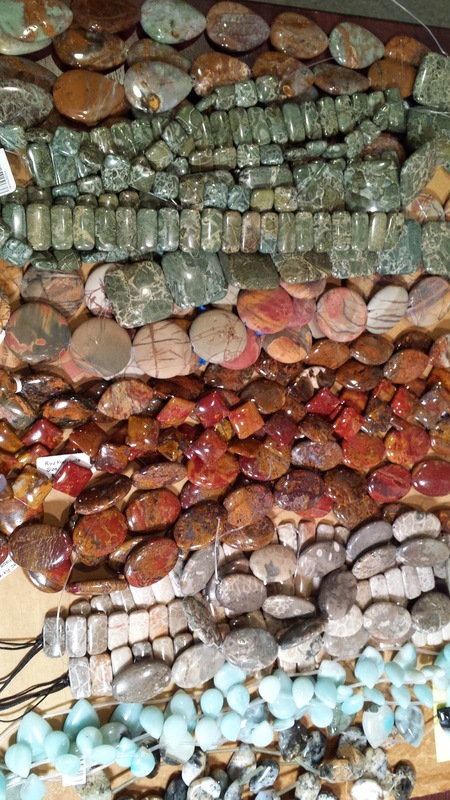 From top to bottom they are snakeskin jasper, green brecciated jasper, red creek jasper, red pietersite, fossilized coral, amazonite, and opalite. I have finished sorting, counting and pricing the stones and manged to squeeze them into my existing storage. I organize most by color. One more step with the stone beads is to research the healing and mystical qualities of each stone. This information gets put into a summary document and is then used to create the descriptive cards I include with every purchase. Knowing the prices per stone of the materials I use really helps me when shopping. As I was browsing in Tucson I would take the price of a strand, count the stones per strand and then use my calculator to see if this was in my price point. Usually when the salesperson saw what I was up to they would run over with their calculator to assist. It was also good for negotiating! They were eager to make sales! Next up are the metal beads and accents. Same process as the other items. I am itching to start creating with all these new baubles, but this is one of those many necessary tasks to my business that must be done before I start creating.